The Armenian Gay and Lesbian Association of New York (AGLA NY) is very troubled by the news that Georgian Police have attacked the office of the Georgian LGBT group Inclusive Foundation and arrested the head of the organization, Paata Sabelashvilli (pictured left). Dedicated to establishing a democratic Georgia, “where sexual orientation and gender self-expression would not be the ground for discrimination,” the Inclusive Foundation is an important voice in the Caucasus, which is still plagued by homophobic public policies and severe brutality against LGBT people in general. 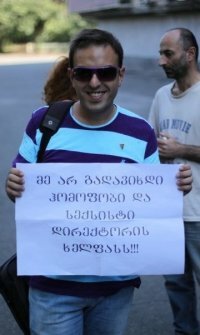 In a statement issued today, ILGA-Europe said it was “shocked” by the conduct of the Georgian police, “which had clearly homophobic motives.” The group called for the immediate release of Mr. Sabelashvili. AGLA NY joins its voice in the international call for the release of the LGBT leader. The following is Inclusive-Foundation’s appeal to the Georgian government and all international organizations. Please circulate this letter to everyone you know. I’m ashamed of my Georgian government.